:: we finally found a new (used) car for me, after four or five months of looking. toyota camry wagons are hard to come by in this baby boom but i gots me my champagne model sitting in the driveway. we now have two stationwagons. oh my. :: a post office box finally came available for me at our local post office. i've been on a waiting list for a year and had pretty much given up hope. but now, you can send me whatever magical goodness your little heart desires at po box 155, kingsville, vic 3012 and i can stop worrying about sending our home address all over the globe. :: i finished a big quilt top and backing for our new couch quilt last night. the fabric has been sitting in my WIP box since before christmas and i planned to baste it at sewjourn, where i will hopefully have the room i don't have here. can't wait to get to the quilting, i'm going to try something a bit different (for me) on this one. :: and the biggest, most exciting news: i finally booked our flights to canada for july/august this year! i'm so glad to have this done and settled, it's been on my mind for months. i got a GREAT deal through quantas, so cheap that i booked mae her own seat so that we can all be a bit more comfortable on our FIFTEEN HOUR flight to los angeles. i'd be lying if i didn't say i am totally worried about how she is going to handle the flight but at least there are two of us and we have a bit of room. can't wait to see my family! That is so cool that you are going to Canada. I would love to go there! try & be relaxed about it, there is only so much you can control! Glad you had a good week! Thank you for sharing. Have a lovely merry happy weekend and love to you and yours! Oh i adore that picture...so lovely and precious! okay. just a couple of things. 1. i love wagons. especially japanese ones. 2. i love booking flight to canada, too. whoohoo. 3. i am super excited to see your new couch quilt. That's so exciting about your trip to Canada! I'll be keen to hear how you go flying with Mae - we're taking Ali to San Francisco and New York in September this year and I am soooo excited about the holiday but a bit scared about long-haul with toddler. So far the tips I have been given by other flying mums are (1) lots of never-seen-before toys and (2) phenergan. been meaning to comment all week, and here you go on this posting rampage ;-), thus making me woefully behind with my comments! congrats on the better sleep :-) i know how hard it is to figure out how to help make it happen ... i ultimately reached my breaking point one sleepless week when my daughter was 6.75 months old. i just decided that one week of sleep training hell (for us all) was far better than a lifetime of poor sleep habits (for her). which brings us to baby #2. i was shocked to discover how much more relaxed/less stressed i am the second time around. because you really, really do learn so much with your first child ... and b/c you're so much busier with 2 kids that you just can't sweat as many details. so it's been a more blissful experience, for me at least. transitioning the first child to life with a sibling, however, has it's challenges. your talent with stuffie-making clearly carries over to quilting :-) you have a wonderful eye. Yay, that all sounds awesome! Happy for you love. We flew with Enzo (24 hour trip) when he was a little over a year old. We bought some new toys that we unwrapped. We prepared ourselves to go with the flow and he was fine the whole way. If Mae is used to a car seat, she might be fine seating in it the whole time. Make sure to ask for a seat with more leg room. Makes a world od difference if you do need to stand with her for a while. You will do great. The trip to Canada is so exciting, it will be so nice to introduce Mae to all your family. I've heard that you're allowed to take your car seat on the plane with you when you buy your baby a seat, so she'd be able to sleep in that. My cousin just flew from England with an 18 month old and it worked well for her. If you work out the trick to day time naps now then let me know! Man oh man I love the quilt in your last post! Did you buy stuff specifically for this quilt or was it all scraps? I'll be hoping the weather is nice in Alberta this summer - for you and me both! Oh I miss Edmonton summers and all the fun festivals! whitney, the redpinkgreyblack quilt was a combination of both. i never use black but i had a surprisingly large amount of it in my stash, all in prints i LOVED. then amitie had a sale right before i started work on it so i picked up some small pieces and the binding fabric there. and man, i hope edmonton has a nice summer too! it'll be winter here so i'll be needing some sunshine. I've came across your blog. I love it. Ooohh! 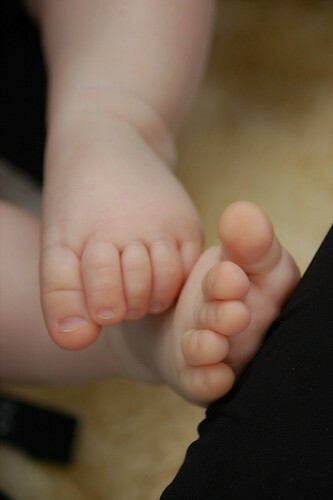 these little feet are so adorable! I just booked a flight to the east coast (we live on the west coast of the US) and I am nervous, too. Chloe will be 5 months old, and I think it will be quite a challenge without Daddy there to help. Luckily, I've found lots of information on the web with travel tips for flying with babies. I'm new here and your blog is absolutely charming! Mae is such a little cutie too! It is always nice to see a fellow Canadian too! Good luck on the flight.